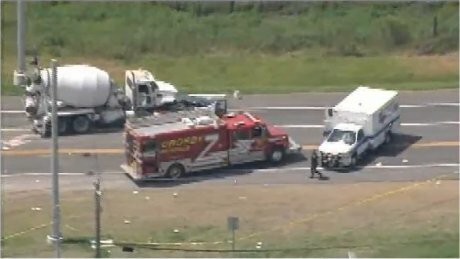 The driver of a pickup truck was killed Monday morning in a collision with a concrete truck at the intersection of FM 1942 and Bohemian Hall Road in Houston. The collision happened around 10:50 a.m. Police say the pickup driver was pronounced dead at the scene of the accident and a female passenger was transported to the emergency room at Memorial Hermann. The concrete truck driver was also transported with minor injuries. Images from Channel 11 News‘ helicopter footage show the concrete truck came to rest in the opposing lane of traffic. According to Channel 2’s news coverage, the cause of the accident was the pickup truck driver’s failure to yield the right-of-way at a stop sign. Channel 2 reports that the female passenger was life-flighted, and lost her right arm in the accident.